The 10 Best Steakhouses in Missouri! No matter how you prefer your steak cooked, there are many places for you to choose from in Missouri. From Kansas City to St. Louis and everywhere in between, the number of restaurants are endless and each location will provide a different experience. Here are some of the finest steakhouses in the state! Opened in 1980, Fredrick Inn Steakhouse has been a staple in the St. Joseph community. Located on Fredrick Avenue, the restaurant offers an all-you-can-eat soup and salad bar with their evening entrees. If you are craving a steak or one of t heir nightly specials, then stop by and take a chance on this hometown favorite. Since 1995, the Cleeton family has served a select choice of beef and seafood in Columbia, Missouri. Their establishment was created to bring the best characteristics of New York and Chicago-style steakhouses. Make sure to call ahead and make a reservation to experience fine dining in Columbia. Since 2001, Lucky J Steakhouse and Arena has served daily hand cut steaks to customer in the Joplin area. They also serve burgers, chicken, appetizers, and sides. Along with their food, they have an equestrian arena that hosts barrel racing, horse shows, and team roping. If you are traveling through and need a place for your horse, they offer overnight accommodations in their horse motel. Located in south County Club Plazas, Stock Hill provides Kansas City with a top-notch dining experience with upscale décor and delicious food. Their menu includes favorites like prime KC strip and wild Alaskan halibut. Stop by for live music during the weekend or grab a drink with your friends during their social hour with a special menu of food. Citizen Kane’s is a family owned and operated establishment that has served their area since 1993. Their turn-of-the-century Victorian home provides a charming atmosphere for their award-winning cuisine. Their menu includes filet mignon, New York strip, and shrimp scampi. Join them for dinner to try one of their amazing dishes and enjoy the beautiful ambiance. J. Gilbert’s provides USDA prime steaks and a variety of seafood on their menu in the St. Louis area. Enjoy your meal in an elegant and intimate atmosphere of the restaurant. If you have a gluten allergy or need vegetarian options, they have a select menu you can choose from listed on their website. Make sure to call ahead to reserve a table if you are wanting to try this gem in the area. If you are looking for a hometown tavern type of place to try a juicy steak, stop by the Double TT Steakhouse and Bar just an hour south of Kansas City. With a full lunch and dinner menu, there is bound to be something for everyone. The restaurant’s atmosphere is great for those looking for a place to take the whole family or just a few friends to grab a bite to eat. Check out their full menu on their Facebook website for more information. Located inside Isle of Capri Casino, Farraddays Steakhouse offers guests a stylish and inviting atmosphere to enjoy a delicious steak or seafood dinner. Their food is prepared by the Executive Chef Ray Leung, who has a decade of experience in casinos and resorts restaurants. Make sure you go on their website to make a reservation for dinner. Dhafer’s Mediterranean Steakhouse is family owned and operated by Chef Dhafer Al-Makute. The menu items are made to order and they list that their items are 90 percent gluten free. 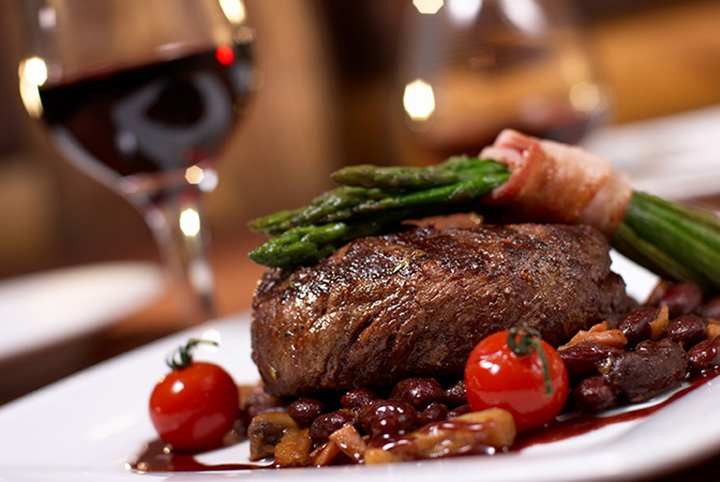 Offering both a place to host a large group and carry-out service, this restaurant gives this area of Missouri a unique flare to a steakhouse. Check out more information about all that they offer on their website. With a menu that includes steaks and seafood, Flame Steakhouse and Wine Bar can provide your group with an upscale dining experience. Along with their food, they offer a variety of wines by the glass or the bottle. Make sure to call ahead and make a reservation if you are in the Springfield area.